James Holden and his crew navigate a dangerous solar system in the new SyFy series "The Expanse," premiering tonight (Dec. 14). The new space-based adventure series "The Expanse" debuts on Syfy tonight, and it's packed with high-flying action, interplanetary politics and intriguing locations. Based on the book by James S. A. Corey (a pen name for co-authors Ty Franck and Daniel Abraham), "The Expanse" takes place 200 years in the future, when humans have settled Mars and the asteroid belt. The two-night premiere event begins at 10 p.m. EST tonight (Dec. 14) and continues at the same time tomorrow (Dec. 15), but if you just can't wait, you can also watch the series' first episode online on Syfy's website, Hulu, YouTube, Amazon and other online providers, where it has been available for the past three weeks. You can see a trailer for "The Expanse" here. In just the first few episodes, the show visits a trans-solar-system ice hauler (sort of like a barge in space), a Martian warship, an enormous colony on a spinning asteroid and a futuristic Earth. These settings act as playgrounds for a collection of characters seeking survival, power and understanding in a dangerous solar system. Space travel is hard, politics are treacherous and multiple factions balance on the brink of war. Weaving through all of those locations is the mystery of a missing girl, tracked by the for-hire policeman Detective Miller, and the adventures of Jim Holden, 2nd officer of the ice hauler Canterbury, and his crew. Earth politician Chrisjen Avasarala also stars in her own segments of the narrative. Co-authors Franck and Abraham were closely involved with the series' first season, which will run for 10 episodes on Syfy and should roughly cover the first book of the series (which currently has five books). The duo was on set almost every day, writing episodes and filling in particulars, such as what Avasarala was up to during the events of the first season. Though she appears in the show from the beginning, she took until the second book to make her first appearance. One of the book's most interesting aspects that is making it over to the series is the differences between the inhabitants of the different solar system locations — besides their locations having a strong impact on social class, "Earthers," like Avasarala, are shorter and stockier, while "Belters," who live in lower-gravity conditions like the asteroid belt, are long and lanky (and unlikely to take full-gravity locations well). As humans change the solar system, the solar system is also changing them. 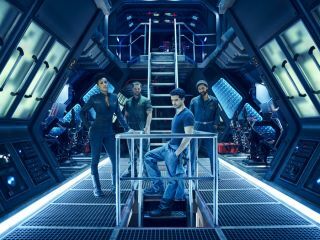 From the very first moments of "The Expanse," it is clear that Syfy is pouring a lot of time, money and attention into creating a well-rendered futuristic setting full of world building and intrigue. Drawing from the detail in the books and focusing on the complex future societies humans have developed just might create a distinctive, nuanced take on solar system exploration and what exactly it means to be human. Plus, there will be epic space battles and explosions.